Malik Rahim, a civil rights fighter and community activist, was honored for his work Friday, Jan. 18, 2019, at Southern University at New Orleans. He was photographed Saturday, Jan. 19, 2019, near a 16-foot wide mural in Algiers featuring him and neighborhood resident Enid Songy. Brandan ‘BMike’ Odums and students from L.B. Landry-O.P. Walker College and Career Preparatory High School painted the mural. The 71-year-old community activist had just been honored with a four-hour “Living Legend” ceremony at the Southern University at New Orleans campus that included more than two dozen speakers, artistic performances and short films, all focused on Rahim and his life’s accomplishments. At the event, which kicked off the weekend before the annual Martin Luther King Jr. Day holiday, Rahim was heralded, again and again. “You, sir, are the dean of social struggle and the godfather of the revolutionary change. And you are a living legend who is happiest when you are fighting for your people,” said Angela Allen-Bell, the director of the Louis A. Berry Institute for Civil Rights and Justice at the Southern University Law Center. Midway through the celebration, a group of young children ran in, carrying stacks of newspapers and yelling, “Read all about it.” They distributed an eight-page edition of the Black Panther newspaper devoted entirely to Rahim. Monique Moss and her Third Eye Theater honored Rahim with dancing and drumming featuring Titos Sompa, a legendary performer from the Republic of Congo. The Spirit of Fi Yi Yi Mardi Gras Indians danced and sang. Poets Black Pearl and Sunni Patterson offered odes to New Orleans and rebellion. Finally, Rahim was presented with a pile of official proclamations, from the Louisiana Legislative Black Caucus, the New Orleans City Council and U.S. Rep. Cedric Richmond. As he held the proclamations and looked down at the microphone in his hand, he said, “I’m at a loss for words,” noting that he is rarely tongue-tied. “You got that right,” shouted a man with a tall shock of gray hair. Even the catcall added depth to Rahim’s story. The man with the gray hair, Albert Woodfox, 71, helped to found the Black Panther Party chapter at the Louisiana State Penitentiary at Angola. 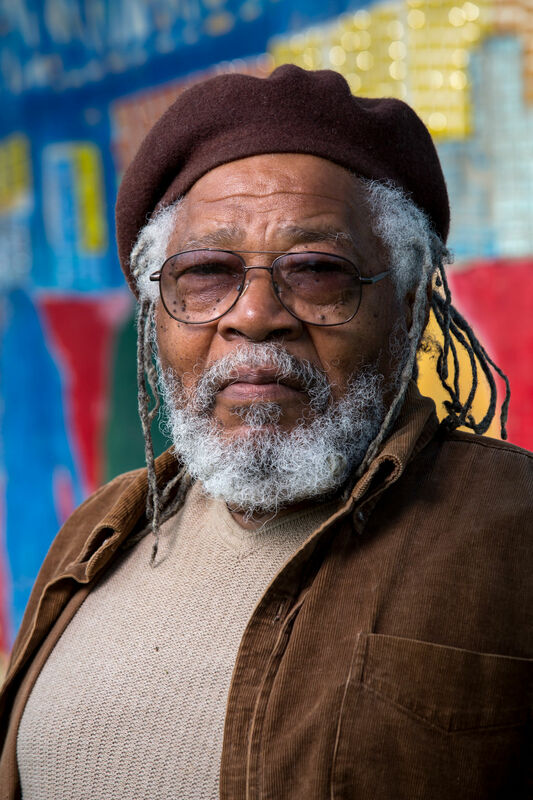 He spent nearly 44 years in solitary confinement at Angola but was released three years ago, thanks to a coalition that Rahim helped to form nearly 20 years ago that worked to free him and the two other members of the Angola Three, Robert King and the late Herman Wallace. Rahim was born in New Orleans in 1947 as Donald Guyton and grew up in the city's St. Bernard housing development. He joined the U.S. Navy as a teenager, did a tour in Vietnam and came home to witness the flowering of the civil rights movement. Black military men often became involved with the movement after returning home from service, only to be treated as second-class citizens. He joined the Black Panther Party. By 1970, he was a leader in the New Orleans Panthers at a pivotal time, when armed police officers accompanied by a makeshift tank opened fire on Panthers holed up in the Desire housing development. Years later, after Hurricane Katrina, as the flooded city lay in ruins, Rahim put out a call for volunteers through a group he’d formed called Common Ground. The group’s thousands of volunteers gutted homes, helped people rebuild and established community health clinics. Rahim, once given his time to speak Friday, took a deep breath. “I don’t want to talk too long, but I want to tell you: Let’s come together. Let’s work for our common good.” It seemed like he might end his remarks right there. But then he found his voice, continuing for more than 30 minutes, in a classic Malik Rahim stem-winder that encompassed street violence, the environment and the educational system. Rahim’s face was optimistic. His voice was impassioned.